Last Two Weeks: Walk-In and Evening Hours! Spread the Word! Tell Your Friends! 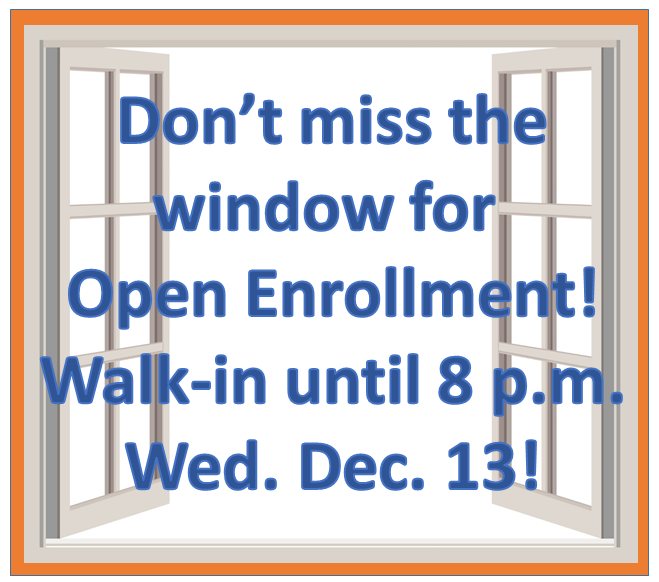 Open Enrollment ends December 15th. Don't miss this window of opportunity! We have walk-in hours, Mon.-Fri. from 9 a.m. - 4 p.m., at 555 Towner in Ypsilanti, MI. You can also call for information or an appointment at 734-544-3030. EXTRA!!! SPECIAL EVENING HOURS!!! 12/13 until 8pm! The WHP office will be open on Wednesday, December 13th until 8 p.m.!!!! Help your friends, clients and community! Download and distribute the flyer below. Dec. 15th is the deadline to sign up for 2018 healthcare on the Marketplace (healthcare.gov). Here is the link to the poster. Life changes happen, and they will qualify you for a Special Enrollment Period. There are some Special Enrollment Periods that are less typical, and the details are important! Survivors of domestic violence are eligible for enrollment in the Marketplace when they leave their batterer, regardless of the time of year. This special enrollment period is available to both men and women, and goes by the "honor system," meaning that no proof (like medical report or court documentation) has to be submitted. It is important that the individual uses the specific term survivor of domestic violence. Not only are victims of domestic violence eligible for special enrollment periods, but they are also allowed to "break" a big rule that applies to most others. Normally, if you are married you must file joint taxes with your spouse to receive tax credits. Domestic violence survivors, however, are able to get tax credits even if they are filing taxes separately while still married. The exception allows people in these situations to still get help with health coverage without compromising their safety. In order to push the application through, the individual must mark on their application that they are not married. If you are in a domestic violence situation, help is available. In Washtenaw County call (734) 995-5444 or visit safehousecenter.org. Anywhere else, call (800) 799-7233 (799-SAFE). Note also: For safety reasons, survivors of domestic violence may choose to use two addresses: a safe mailing address and a home address. The home location should be where the applicant is living in order to access the correct health plans. Have any tips or tricks to share about the Marketplace? Comment below so we can blog about them! Meredith Buhalis began working at the WHP just weeks before the April 1st, 2014 start of the Healthy Michigan Plan. She hit the ground running, doing her first application on her own on opening day! Since then, Meredith has been an asset to the WHP, doing a very high volume of enrollments. As part of the WHP team, Meredith works to help a diverse group of clients navigate the complexities of the current health care system. Although getting health care coverage is the main focus of the WHP, educating people about their options and supporting clients to become their own advocates is her passion. A client wrote this about Meredith. "She is amazing and she will help you! She has put the power back into my hands. These programs are funded and if you are eligible they should NOT ever be out of your reach. Call Meredith. Get the help you need to gain the coverage you deserve." Check out the website and subscribe to our blog! During the Coverage Counts CMS grant, Meredith worked out of the Livingston County Department of Public Health and has helped many community members in both Livingston and Washtenaw counties. Now, Meredith is full-time at the Washtenaw Health Plan offices in Ypsilanti. Meredith first studied education and human development at Antioch College where she fully absorbed the founder's pleas to graduates, "Be ashamed to die until you have won some victory for humanity." After college and brief careers in house painting and restaurants, Meredith attended the School of Information at the University of Michigan. As part of hi-ce, she taught school librarians to use the Internet and helped organize the World Wide Web, pre-google. She worked with nonprofits, technology and social workers before moving on to the wonderful world of school libraries. Now she puts her organizational, creative, and people skills to good use at the Washtenaw Health Plan. Times change. Now, Meredith and family are covered by employer insurance! For instance, Meredith designed the healthcarecounts.org website. Recently, our website and blog has been commended for its amazing marketing team. And that team is primarily Meredith! Meredith lives in Ann Arbor with her husband, the singer/songwriter Chris Buhalis, daughter and dog. ...you thought health care would be too expensive. Now, you're doing your taxes, and you realize that you should have had health coverage, and since you didn't, you might need to pay a penalty! The penalty for 2015 could be as much as 2% of your income. 1. Before you panic, take a look at your whole family, and each person individually, to see if all or part of your family qualifies for a tax exemption. Look at each person in your family separately to figure out who might qualify for an exemption. If anyone does qualify for an exemption, you will need to fill out IRS form 8965. 2. The IRS has some excellent resources. The instructions for Form 8965 have a nice list of exemptions. You can also run through a nice little "quiz" that asks you some questions and guides you to possible exemptions. Here is a simple list of exemptions (scroll down), and it tells you whether you get this exemption through the IRS or the Marketplace. Although most exemptions are given by the IRS, some need to be applied for through the Marketplace. Don't forget--if you are low-income you can do your taxes with free software, free filing, and no messy handwriting! If you got a Marketplace exemption, you will get a letter with an Exemption Certificate Number. [Can't find your letter? Log into your account on healthcare.gov and download it again.] If you have an IRS exemption, you just fill it in on Form 8965. You are a member of a federally-recognized Indian tribe. You had a special hardship, such as an eviction. 3. File your taxes! You can get free help at these locations. And while you are doing your taxes, think about the implications for next year. If during the next year, you get married...divorced...get a new job...lose a job...have a baby...move...graduate from college...it would be prudent to get a health care check-up! 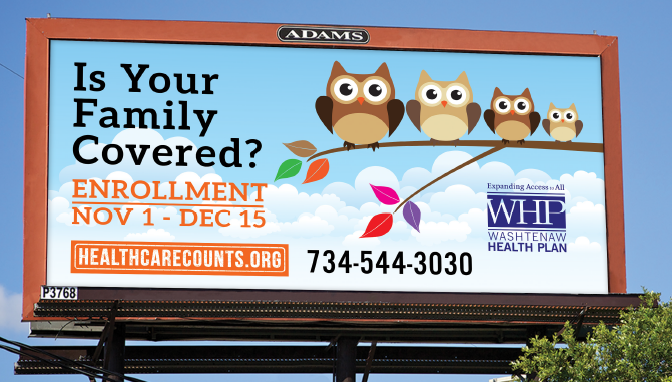 That would be a good time to visit the Washtenaw Health Plan or get some other health insurance help! It's Friday! Learn about a WHP staff member. Free rides to the doctor? Okay! Confused by Medicare? There's Help! Most people who have Medicare are seniors, 65 years and over, or disabled. Medicare typically covers 80% of bills, while the individual is responsible for the other 20%. You can have other insurance to supplement your Medicare, including Medicaid if you are income eligible. Part A Hospital Insurance, which helps cover inpatient hospital visits, nursing facility care, hospice care etc. Part B Medical Insurance, which helps cover doctor services, outpatient care, durable medical equipment, preventative care etc. Part C Medicare Advantage, supplemental insurance plans to help cover the 20% of bills that the individual is responsible for. Part D Prescription Coverage, helps pay for prescriptions. Medicare Part B has a premium amount that may be taken directly out of a social security check. There are Medicaid programs to help pay for the Part B premium. These tips are barely scratching the surface of all there is to know about your Medicare. We are lucky to have a great program to help individuals navigate their own coverage, Medicare Medicaid Assistance Program (MMAP). There are counselors throughout the Michigan helping Medicare beneficiaries and their families figure it all out. For an appointment with a MMAP counselor in your area, call 800-803-7174. There's a National Food Drive on Saturday May 9, 2015! What it is: It’s the pretty much the easiest way to donate food: Just put some nonperishable food in a bag by your mailbox before your letter carrier arrives on Saturday, May 9, and it’ll go to your local food bank (That’s Food Gatherers, if you’re in Washtenaw County, and Gleaners, if you're in Livingston County)! You can use any bags you have handy, and you'll get the great feeling that you’re fighting hunger! What they take: The Stamp Out Hunger Food Drive will take donations of nonperishable foods in non-breakable containers (no glass jars, please). For instance: canned meats and fish, canned fruit, canned vegetables & beans, baby food and formula, Ensure or other liquid nutritional supplements, peanut butter, canned or boxed stews and soups, dry milk, cereal bars, boxed or canned juices, boxed instant food, boxed or bagged pasta, rice & dried beans, baking mixes… or use your imagination and donate the foods that you want to give to people in your community that suffer from food insecurity. What it is: it’s the nation’s largest single day food-drive, and it’s brought in way more than a BILLION pounds of food in the last 20 years. Led by the National Association of Letter Carriers (AFL/CIO), with help from other postal employees, rural letter carriers and additional volunteers, all 50 states plus DC, Puerto Rico, Guam & the Virgin Islands- more than 10,000 cities- all participate in this giant food drive on the second Saturday of every May, thoughtfully scheduled to occur in the spring because food banks are between the holiday season and the growing season, and suffer most from a depletion of stores right about now. What it does: Currently, this amazing food drive brings in around 70 million pounds of food in a single day- that’s a phenomenal result! What does it mean to us at Food Gatherers? Last year, it meant 129,000 lbs of food! Our sincere thanks to our nation’s letter carriers for this terrific event, and for helping to fight hunger where live! Thanks to the letter carriers! This post is being re-blogged from our friends at Food Gatherers, Washtenaw County's food rescue program. But remember, letter carriers across the country will be collecting food on Saturday! So it doesn't matter where you live, you can participate!